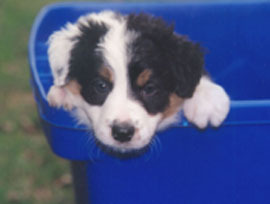 Deaf dog: Gilligan, a Australian Shepherd/Jack Russell Terrier mix puppy. Deaf dog: Sparky is a 9 month old Australian Cattle Dog. This dog is extremely intelligent and adapts well to his situation. He is just now starting to learn agility and herding skills. Deaf dog: Gus is a 17 year old Westie. Gus was rescued from a nearby shelter when he was 5 years old. We have had him ever since. He really is a great dog and so sweet. He may be 17 yrs old now but he is in great shape, he lost his hearing about 2 years ago and now his eye site seems to be dimming. We know he may die soon and it will be hard to see him go, we love him so much. Tucker is a 2.5 year old Westie. He was rescued over a year ago thru the West Highland White Southern CA rescue group. Tucker was found at a pet shop (no one knew he was deaf). Eventually he made his way out west from Las Vegas and he is wondeful! He is full of life and does silly things but you'd never know he was deaf. Deaf dog: Buzz (Aussie Mix) was rescued from a feral mom in Northern Ca. Fostered for a few weeks by Georgia, I found him on the DeafDogs site and he was transfered to Southern California. He is the most lovable dog I have ever owned!! and I even had an idea he could hear... I had him BAER tested and... he is deaf in only one ear. He has wonderful herding instincts!! - Toby knows this the most!! Deaf dog: When I first got the dog (boxer-pit bull mix) it was for companionship with my other dog. I wanted the same type of dog so I knew that a litter was around so I spoke up and said I wanted one (boy). He did get the care he needed when he was with has brother and sisters. The third day I had him I said "he's deaf!" and sure nuff - little guy can't here a thing. So now he's spoiled like a little prince. My three year old girl dog helps out so much. Got him at five weeks now he is three months. He is starting to pick up signs. But bites like two puppys !! !He likes walking in the park just if its only prince and I. He also likes skateboards - not chewing them but likes to pump and hop on. I think he's a real smart ... We live 1.5 miles away from the train, only one time has it coupled together, but you can feel it as you're hearing it. When this happend he ran like crazy. He has got a lot to learn! Deaf dog: My wife fell in love with Target (English Cocker Spaniel) the first time she saw him at a breeder friend's home. He has been the best dog we have ever had. Target was born deaf in 1997. He is extremely good at hand signals. He can tell when the gardeners are coming to our house 5 minutes before my hearing ECS knows they are comming. He also looks at the mirrored wardrobe doors in our bedroom to pick up vibrations. We live in Camarillo, CA and he was born not too far from here, we got him as a puppy knowing he was deaf. 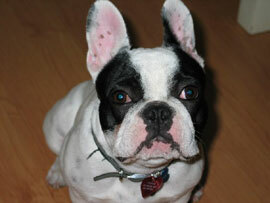 Deaf dog: Charlie (French Bulldog born in 2002) is a born comedian. He snores like a sailor (sorry sailors). We didn't know he was deaf when we brought him home, but now we wouldn't have him any other way. 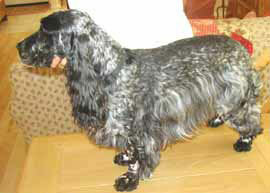 Other Comments: I am active in the deaf dog group and willing to transport if necessary or do home visits. 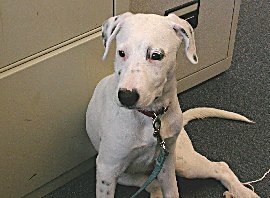 Deaf dog: Magee is a 6 month old Dalmatian mix. "Magee has healed my world. I am a back patient who has had 2 back surgeries and I am confined to bed a lot of the time, except when Magee takes me on walks throughout the day. Since having Magee my health has improved 80%. The doctors are amazed. She is always so gentle with me, but loves to play crazy tug-of-war with my 12 year old son. " Human companions: Michelle Hansen, her husband and son. 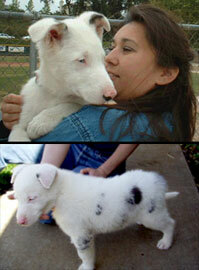 Deaf dog: Whisper, Border Collie pup born deaf. She's brilliant and learning with the "clicker flashlight". She already sits and downs, and she is now also learning agility. Human companion: Russ, who specializes in training deaf dogs. Deaf dog: Zion is a 12 week old Great Dane. "We got Zion at 6 weeks old. He is a very very quick learner, he knows sit and almost knows lay. He has been house trained for weeks! He is a little spoiled and only wants to sleep by his mommy or on the couch." Human companions: Jerry & Linda Norwood, Cody, 18 and Ashley 16. Other pets: Zeus, 4 year old Great Dane and Reagan, 4 year old Bassett mix. Deaf dog: Sydney is a 4 year old Australian Shepherd. "Sydney is a really cool dog! When I first saw him I knew he was special. Two years ago, Sydney was dropped off for training at the kennel for training and was never picked up. It's sad they never got to see the results of his traning. Being partially blind, with those bright blue starburst eyes, he learned big sweeping hand gestures for come, sit, lay down, and stay. He also heels and walks marvelously on a leash. All in all I think he's really an amazing dog for one who is deaf and blind. He's a breeze to handle and it's great having him around. He never stops making me laugh." Human companions: Terren B., boyfriend Paul, and Emily his Grandmother. Other pets: Goldie, Cocker Spaniel and Yoshi, Tabby, keep Grandma Emily company. Deaf dog: Zero is a 2 year old American Pit Bull Terrier. " I had passed on dog ownership and issues of responsibility for quite a while until I babysat this guy from 3 to 6 months old while his owner traveled. Then, I just had to have him for my birthday present. He's funny the way he barks at imaginary things, and when he wants to go for a walk he opens his mouth and closes it like he's seen us do when we talk, but no sounds come out. He's very playful, earning his latest nickname 'matrix dog' for his wild indoor sprinting. " Other pets: He has a friend, a white miniature schnauzer, who he plays with all day. See photos of Zero and his friend. 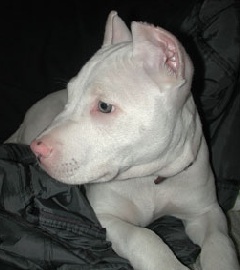 Deaf dog: Tank is a 5 month old American Pitbull. "Our Tank is just that, a big tank. We got him around Valentines Day 05 and has been our big baby ever since. He is very smart and has picked up every sign we teach him."